Collectors and investors have been scouring auctions all over the world in the hunt for Aboriginal artefacts as a global tribal artefacts trend continues to emerge. Bonhams Australia sold a number of important Aboriginal artefacts during their 28th May Aboriginal Art auction. 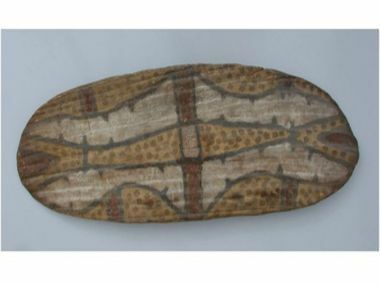 A South East Australian parrying shield from a UK private collection sold for $9,600, a South Australian broad shield fetched $22,800 while a set of five small Tiwi Pukumani grave posts made $12,000. Another rainforest shield from North Queensland was sold by Sotheby’s Australia on the 5th of June during their Important Aboriginal Art sale for a hammer price of $42,000 against an estimate of $20,000-$30,000. Christie’s Paris sold a Wunda Wunda shield for €6,250 against an estimate of €5,000 - €7,000 during their 11th June Art Africain et Océanien sale. Sotheby’s Paris sold two Aboriginal shields during their 12th June Arts d’Afrique et d’Oceanie sale. The first, a beautiful Aboriginal parrying shield from the Murrumbidgee River area sold for €16,250 against an estimate of €7,000-€10,000, while the second, a less impressive parrying shield sold for €3,750 against an estimate of €3,000-€5,000.